Baylor won the women's basketball championship, holding off Notre Dame, 82-81. Tonight's men's shining moment between the defensive powerhouses of Virginia and Texas Tech (9:20 p.m. ET) is expected to be one of the lowest-scoring games in title game history. The over/under for points: 118. 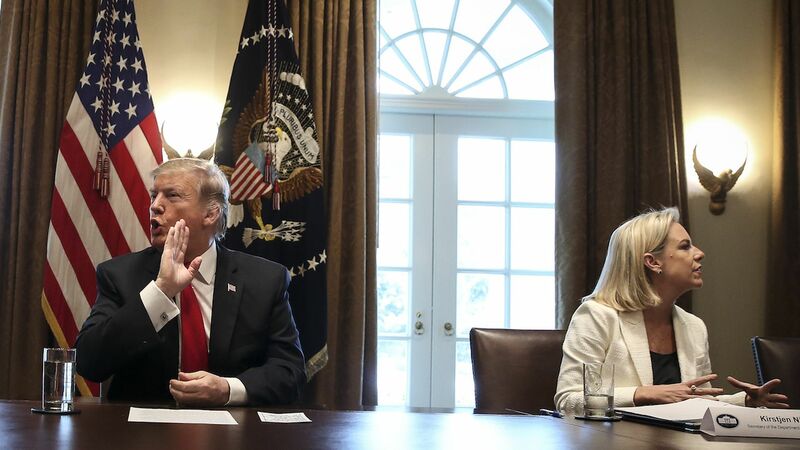 Homeland Security Secretary Kirstjen Nielsen brought her resignation letter with her when she met President Trump in the White House residence yesterday afternoon, top sources tell Axios. She wasn't intent on quitting but was prepared to, sources tell us. The meeting went poorly, and Trump didn't even let her announce her "resignation." While she was racing to put out the letter (not that different from one she wrote after midterms), Trump tweeted that she "will be leaving her position." "She was undercut at every turn," a source close to DHS said. "She's done everything she can do. The White House is eating their own." Nielsen had been on the outs with some in the West Wing for at least six months, top officials tell us. National security adviser John Bolton has felt the increase in immigration numbers made it clear that her policies weren't effective, and thought the president should relieve her of her duties, a senior administration official said. Back in October, accounts surfaced of a shouting match between Bolton and Kelly. It turns out that it was over Bolton's Nielsen conversation with Trump. Be smart: Nielsen's departure empowers White House hardliner Stephen Miller. A Republican Senate aide tells Jonathan Swan: “Nielsen leaving will make conservatives who were getting fed up with DHS happy." "Real question will be who’s the [permanent] replacement and does that person have the credentials?" Go deeper: Read the resignation letter. A new plan for regulations released by the U.K.. government today puts legal responsibility on tech companies for any harmful or unlawful content that appears on their properties, Axios' Sara Fischer writes. If passed, the proposed laws would force tech companies to operate with much more rigor when policing content on their properties. Tech giants could face big fines if they don't remove terrorist videos or hate speech in a timely fashion. Why it matters: While the law only extends to the treatment of content within the U.K., it could have major implications for how tech companies operate and are regulated globally. U.K. Digital Secretary Jeremy Wright: “The era of self-regulation for online companies is over." 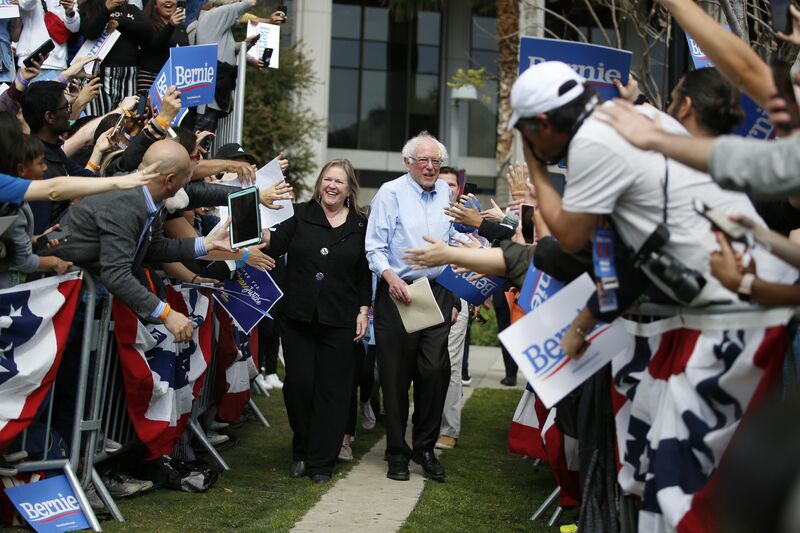 What's new: "Vermont Sen. Bernie Sanders is ... surpassing his rivals in early fundraising and establishing himself as an indisputable front-runner for the Democratic presidential nomination," AP's Juana Summers and Julie Pace write. "Less than two months into his second White House bid, no other declared candidate in the crowded Democratic field currently has amassed so many advantages: a $28 million war chest, a loyal and enthusiastic voter base." Why it matters: "He now carries the weight of high expectations and will face heightened scrutiny over everything from the cost and feasibility of his government-funded policy proposals to his tax returns, which he has not yet released." The campaign has now promised them after April 15. 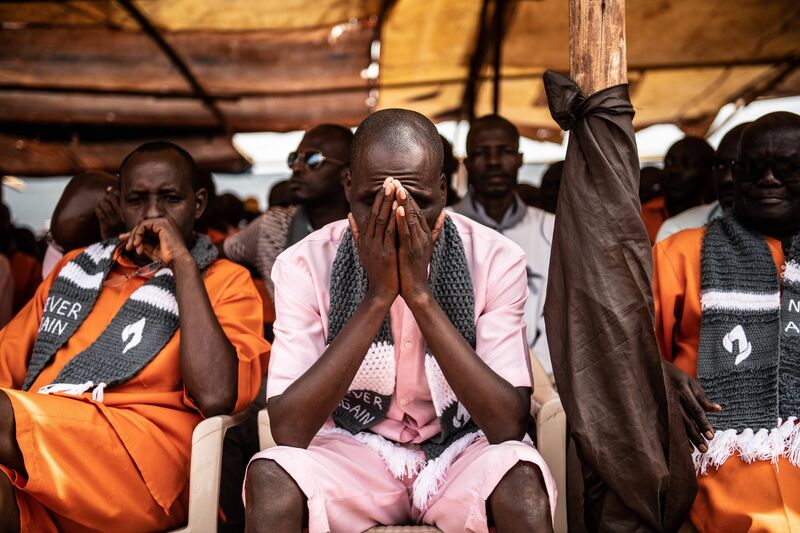 Twenty-five years after the start of a genocide in Rwanda that killed 800,000 in 100 days, prisoners listen during a commemoration in the capital, Kigali. The prison holds many perpetrators of the genocide who are still serving sentences. Some Democratic candidates are adding Fox News to their campaign stops, Axios' Sara Fischer and Neal Rothschild report. While a growing number of Democrats have appeared on the network over the past few months, the announcement of a Fox News town hall with Sen. Bernie Sanders has caused the most stir. The town hall, focusing on economy and jobs, is a week from tonight (April 15) in Bethlehem, Pa., co-anchored by Bret Baier and Martha MacCallum. Why it matters: The debate among Dems over whether or how the party should engage with Fox News is sowing division within the party. Sanders said Friday on "The Daily Show": "[I]t is important to distinguish Fox News from the many millions of people who watch Fox News. "I think it is important to say to those people: You know what? I know that many of you voted for Donald Trump, but he lied to you." Go deeper: See which Dems have been on Fox. Former Secretary of State John Kerry, speaking publicly for the first time about a new chapter in his half-century history with Vietnam, tells Axios' Amy Harder about his effort to get the country off coal-fired power. In an exclusive interview for the "Harder Line" column, Kerry laid out the broad parameters of a proposal he says would enable Vietnam to get off coal by financing renewables — and become a model for the rest of Asia, which is heavily dependent on coal. Kerry has been working on this since he left government in 2017. He has enlisted former Vice President Al Gore, who made a trip there last summer. What’s next: Kerry’s meeting in Boston with a Vietnamese delegation, where he hopes to inch closer to an official deal. A short seller who goes by “Machine Planet” on Twitter has flown over car lots for clues on Tesla’s inventory, and counts idle car-carrier trailers. Facebook has spent 18 months preparing for elections in India, which will be staggered over seven weeks, beginning Thursday and concluding May 19. 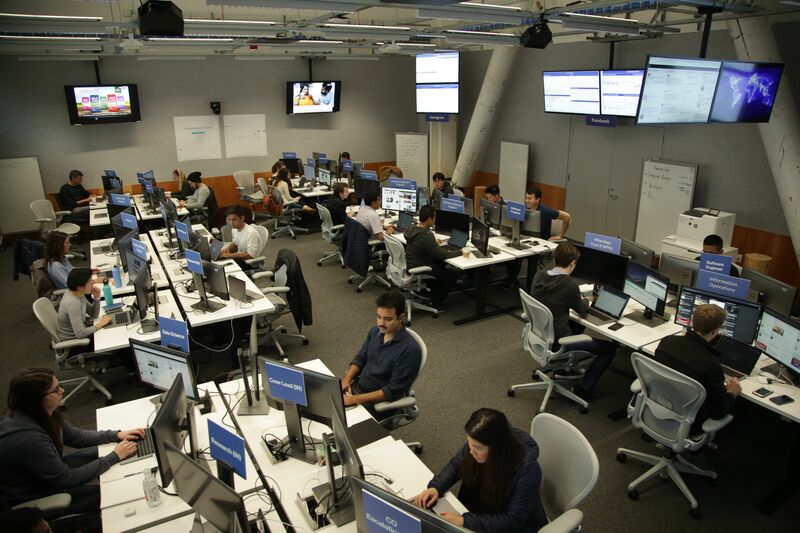 900 million people will be eligible to vote in the world's largest democracy, posing a massive test for Facebook. "Anyone who wants to run an ad in India related to politics has to first confirm their identity and location, and give more details about who paid for or published the ad." "We then run the ad with a 'Paid for by' or 'Published by' disclaimer and house it in a searchable Ad Library for seven years." David Axelrod is making his popular podcast, "The Axe Files," exclusive to Luminary, which has raised $100 million and plans to launch a paid platform with ad-free podcasts, starting with 25 shows the week of April 23. Some of Axelrod's expected upcoming guests: Aaron Sorkin, Bryan Cranston, Jason Rezaian, Meghan McCain and Kal Penn. "The Axe Files" will continue to air once a month on CNN in a televised version. Axelrod told me, as he headed to El Paso to interview Beto O'Rourke, that the podcast is a return to his roots as a political reporter for the Chicago Tribune. "I realized when I was writing my memoir that my whole life has been about storytelling, as a journalist or as a strategist," he said. "Now I get to explore people's stories and try and convey to the listener a better sense of who it is I'm talking to. ... So I'm loving it." How one word can spark an online frenzy ... Netflix yesterday posted on its social media channels a yellow background with the word "Homecoming," per AP. The only other information was a date: April 17. That's when Netflix is expected to premiere a Beyonce special, featuring performances from last year's Coachella Valley Music and Arts Festival. The font and color were the same as Beyonce's at Coachella. Rolling Stone wrote: "[I]n 2018, our Woodstock, our Monterey Pop, our Isle of Wight, is definitively Beyoncé’s headlining set at Coachella." Beyonce last year launched a scholarship program dubbed the Homecoming Scholars Award Program.